This event, titled Site C: Treaty Power or Power Politics, will be held on July 5thand feature six speakers: Chief Bob Chamberlain, Vice-President of the Union of BC Indian Chiefs, Gordon Christie, Director of Indigenous Studies at UBC Allard Law School, Julian Napoleon, a Dane-zaa/Cree from the Saulteau First Nations of Treaty 8 in the Peace River country, who looks at relationships between land, water, food and community within Dane-zaa territory, Adrienne Peacock, a faculty emeritus of Douglas College who worked in the Peace during the first British Columbia Utilities Commission hearings into Site C, the Reverend Emilie Smith of St Barnabas Church, New Westminster, and Dave Seaweed, Aboriginal Students Coordinator. 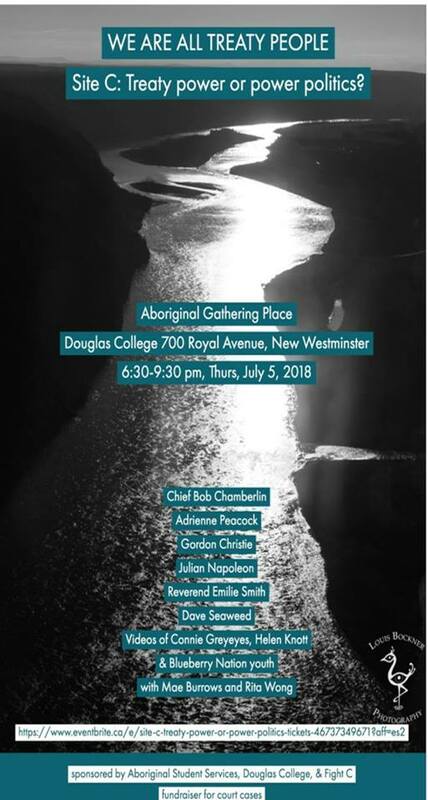 The event will be held in the Aboriginal Gathering Place from 6:30-9:30 pm on July 5th and is intended to profile crucial court cases, the first brought by the West Moberly and Prophet River First Nations, which will frame the case for an injunction to be very focused on Treaty violation. This case is brought forward to prevent irreparable harm to the Peace River valley by suspending work on Site C until Treaty rights can be fully explored. The broader case for infringement of Treaty rights brought by the Blueberry band will also be discussed. In essence, it will be an evening to focus on issues of indigenous rights, focused primarily on Treaty 8 and the significance of treaty rights in reconciliation.